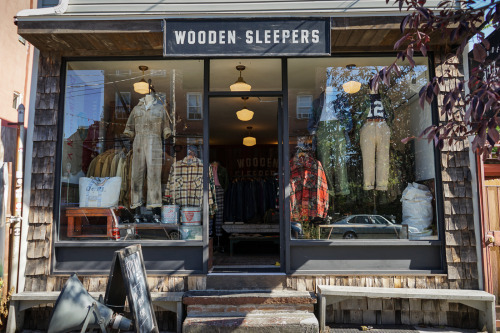 Wooden Sleepers is the kind of store I wish was near me. 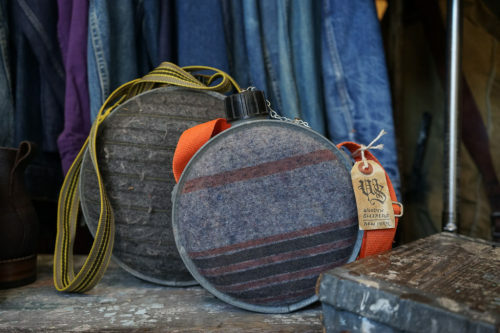 Brian Davis, the shop’s founder, has been around the menswear scene forever, but first opened his shop seven years ago on Etsy. 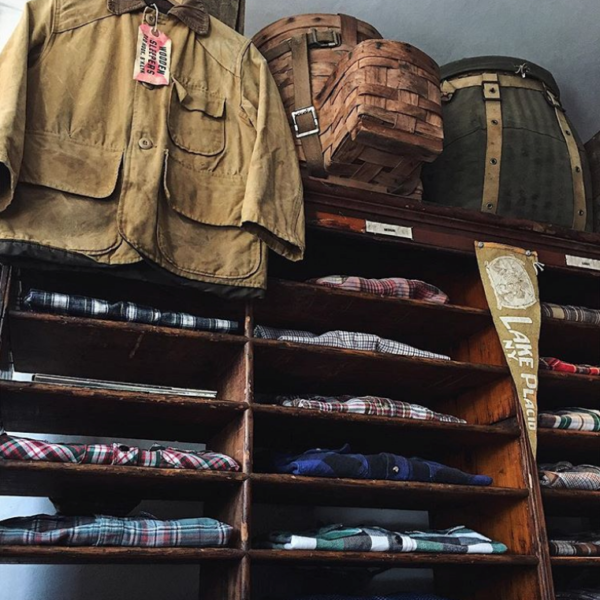 Back then, he just had simple listings for his vintage finds, which ranged from classic Americana to workwear to Ivy Style items. 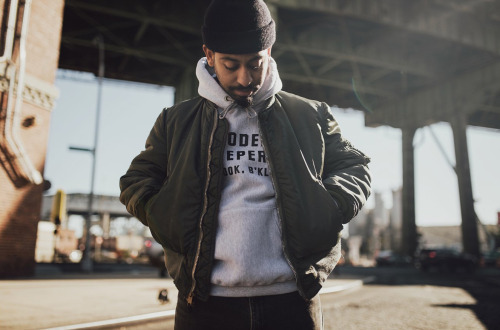 A few years later, he opened a brick-and-mortar shop in Brooklyn, which has been since become a destination spot for men’s style enthusiasts. Japanese menswear magazines such as Free & Easy have featured the store; GQcalled it the best new vintage menswear shop in NYC. 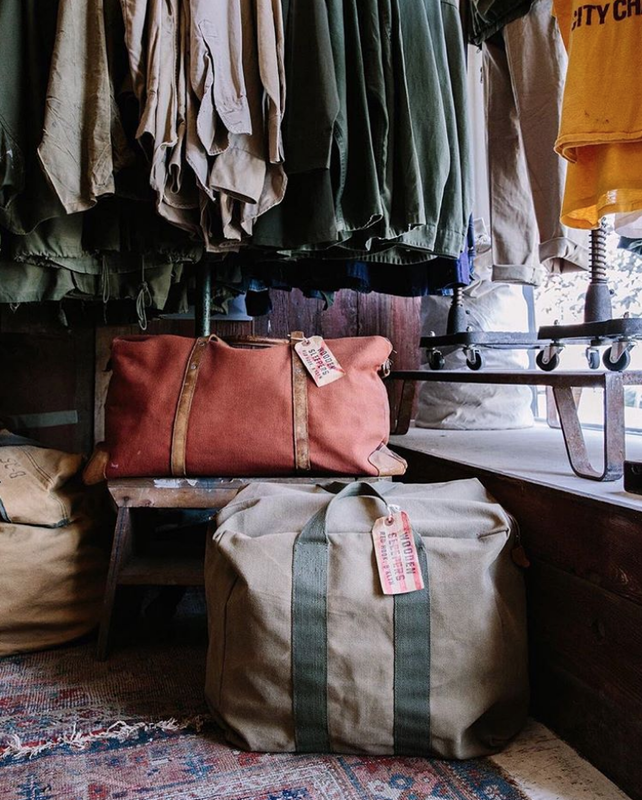 When Brian opened his brick-and-mortar, he took down his online web shop in order to focus on his physical location. Carefully setting up the interior decor and presentation was a lot of work, too much to also include shooting photos and selling online. 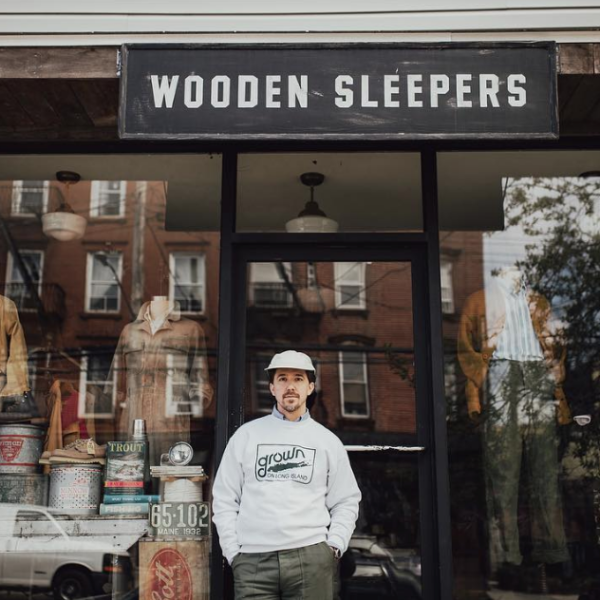 Now that Wooden Sleepers is more established, however, they’ve jumped back on the internet. 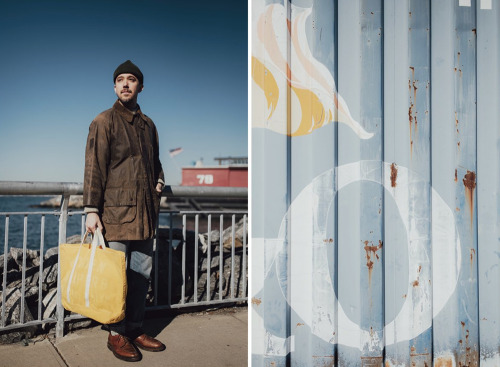 This past month, they launched a fully dedicated online site (although inventory is still being added), and they’re been developing an in-house line of Wooden Sleepers totes, caps, and sweatshirts (we love all of it). 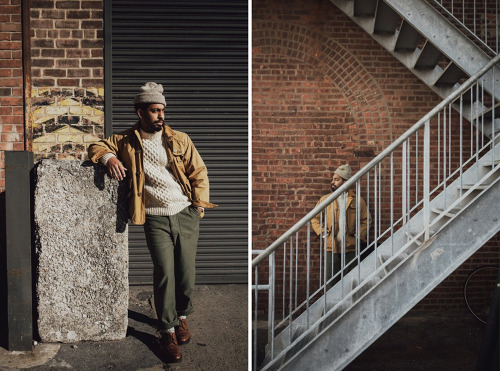 They even shot a fall/ winter lookbook. 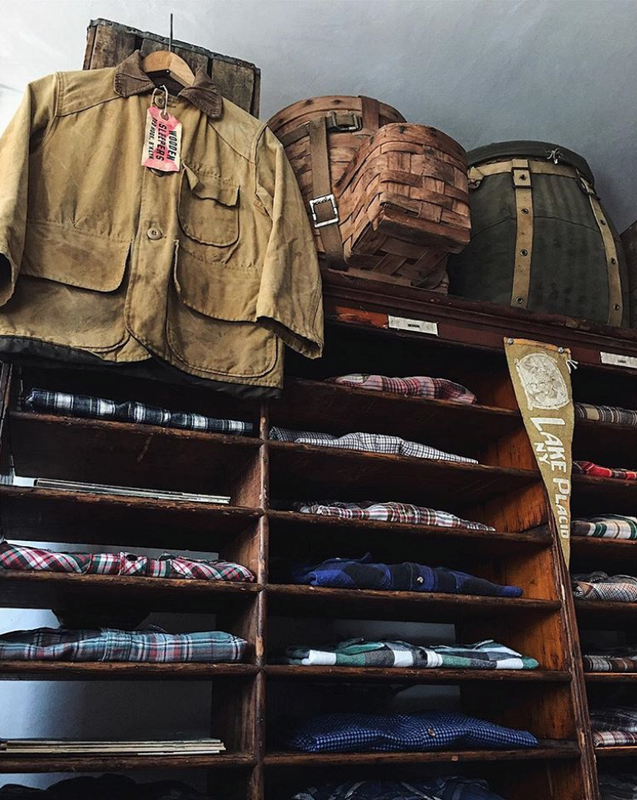 I recently sat down with Brian to talk about his store, his history with vintage clothing, and his style suggestions for guys who are are looking to incorporate a bit of vintage into their wardrobe. 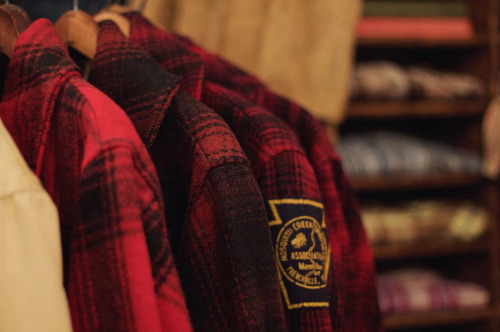 Tell us about how you got into vintage clothing and how you started Wooden Sleepers. I grew up on the east end of Long Island, skateboarding and listening to punk and hip-hop music. I lived with my grandparents at the time, a long way from any of the shopping malls. 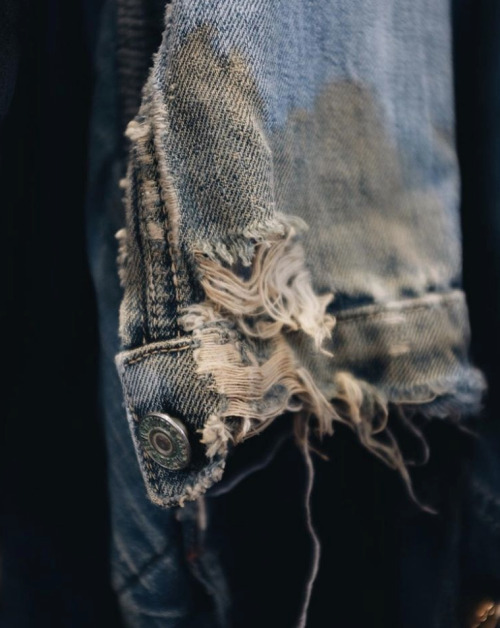 Buying second-hand clothes from local church shops was a way for me to rebel against the Abercrombie & Fitch crowd – this was around the early- to mid-90s, when A&F was big. 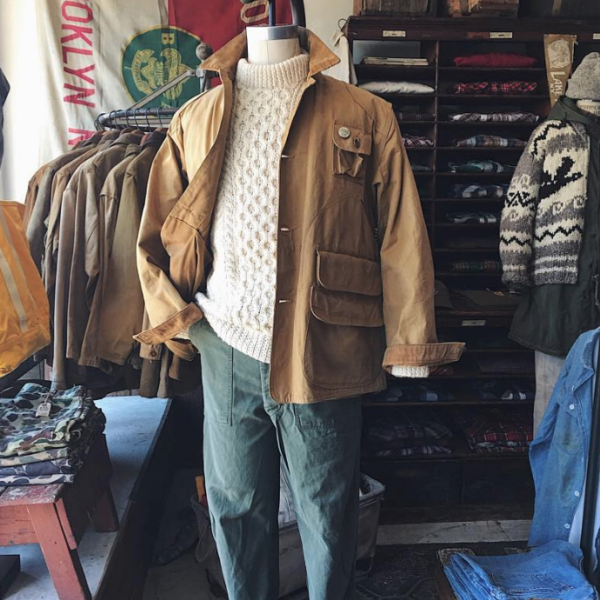 Looking back, a lot of the stuff I used to rummage through would later influence my taste in clothes as an adult – seersucker suits, oil-stained mechanic jackets, vintage Levi’s, etc. Fast forward to 2010, I was working a corporate job and wanted a creative outlet. My girlfriend at the time, now my wife, encouraged me to set up my own clothing shop. 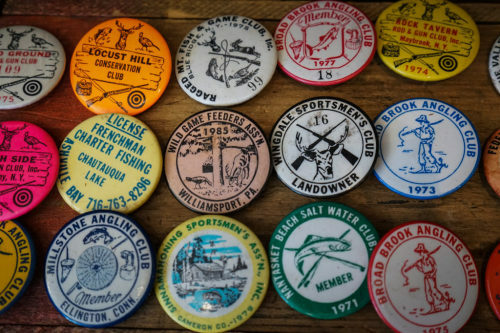 This was when heritage and Americana were huge online. 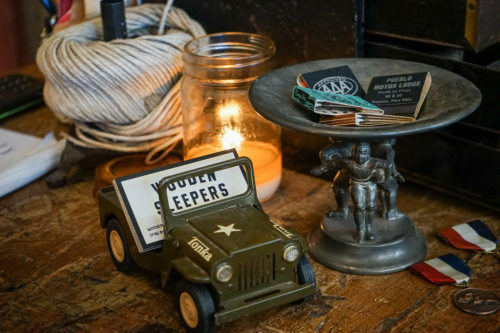 There were sites such as A Continuous Lean, Valet, and Put This On; New York City had the Pop-Up Flea; Etsy was just getting started, but was still a fairly unknown thing. So I started listing stuff online for my thrifted finds. 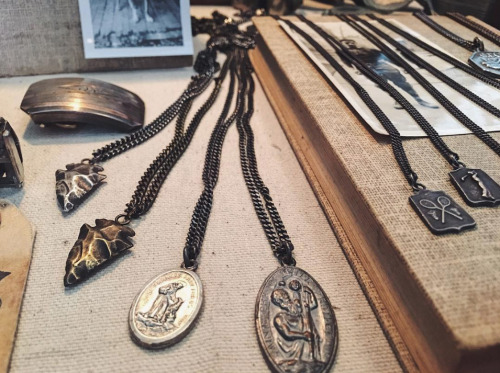 We launched on Etsy in 2010 and then opened a brick-and-mortar in 2014. That’s surprising because, right around that time, many brick-and-mortars started struggling. 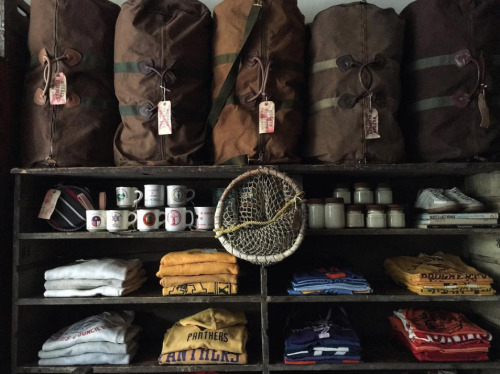 Do you find it difficult to do a brick-and-mortar business in NYC nowadays? 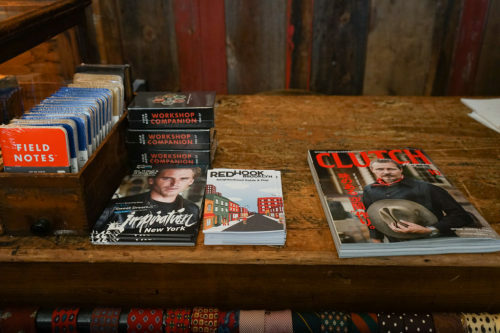 The New York Times had a story not too long ago about Bleecker Street, a big commercial area here with global brands such as Marc Jacobs and Ralph Lauren. At some point, the landlords got greedy and raised rents, and now all those businesses have had to move out. Maybe they could have afforded the rents, but it probably didn’t make sense given the amount of business they were getting from the area. And now, when you walk down Bleecker Street, there are a ton of empty storefronts. 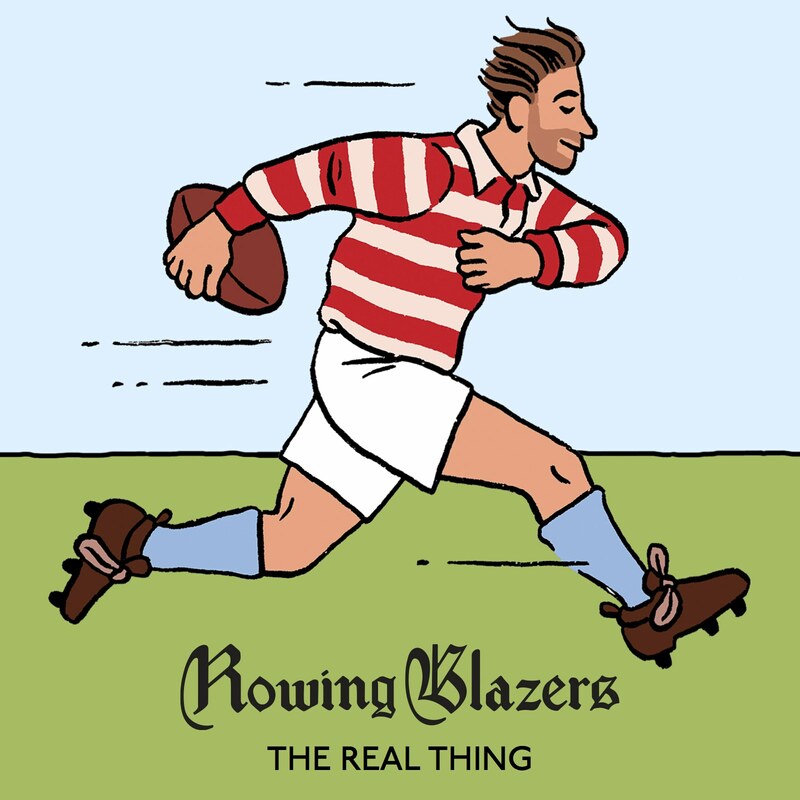 My goal as a business was never about being part of that world. When I was looking for a shop space, I was looking for a place with a thriving community of small businesses. We found that in Red Hook in Brooklyn. Our street is very much orientated around mom-and-pop businesses, with great restaurants and small shops. We’ve actually seen our business grow year after year. 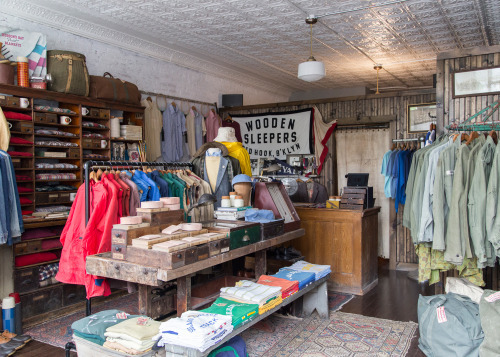 But many small NYC clothing stores have closed – Gentry, French Garment Cleaners, Carson Street Clothiers. It’s not just big brands that are struggling, it seems like it’s everyone. People are so used to comparison-shopping online, they’ll find the cheapest price possible for any given item. 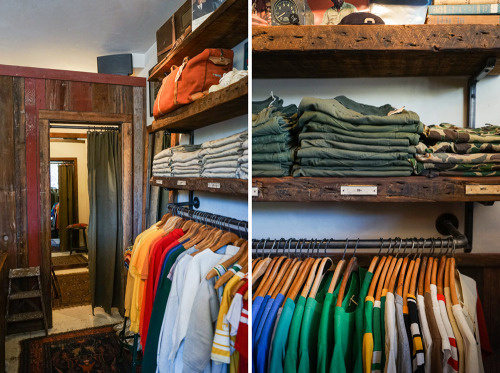 Do you feel you’ve been able to escape this as a vintage clothing store? I think so. 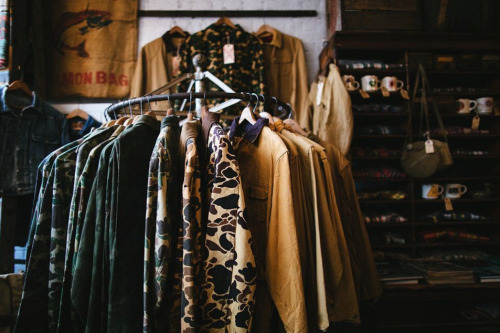 Although you can still comparison shop with vintage clothes, nothing is ever going to be the same exact piece. If you find something and it’s “the one,” you may never see it again. 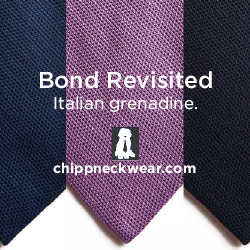 Sometimes there are idiosyncratic details or nuances that make it just right. I also think we’re lucky to have a community that supports us. As a consumer myself, I try to support local and small businesses because I know those companies can easily disappear. And that’s not great for the neighborhood. 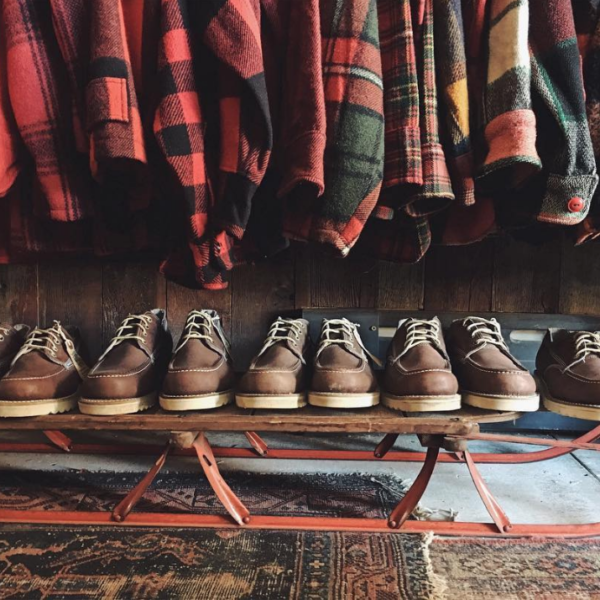 We have many customers outside of NYC, but we’re also lucky to have lots of guys in the neighborhood that enjoy shopping with us. And they’re guys who aren’t going to get on the computer to see if they can find something for ten bucks cheaper. How do you get your stuff? No two days are the same. 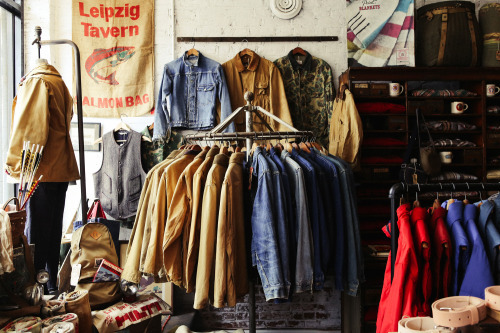 There are wholesale places that sell bales of vintage clothing. 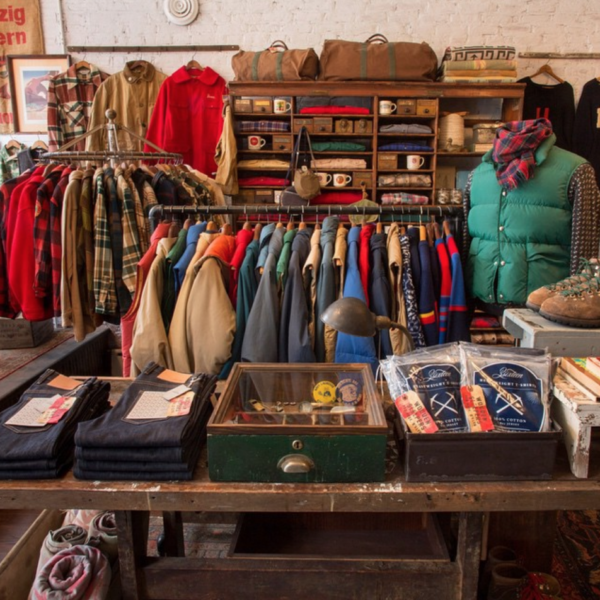 So, you go and buy these dirt-cheap lots, sorted by types of clothes – sweatshirts, t-shirts, jeans, etc. But you have to buy so much junk order to get a few gems. 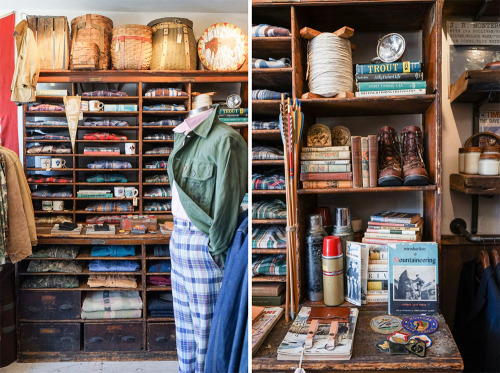 That’s how you get these huge vintage stores with a ton of inventory, with racks and racks of stuff. Our business model is the exact opposite of that. We have a very small store, which forces us to edit. I only want the gems. Which means I have to go out and source things myself, often piece-by-piece. That can mean anything from crawling around an attic to get vintage chore coats to digging around an estate sale. Sometimes I’ll follow a lead I read about; sometimes I network with other pickers around the country. The key is to always be sourcing because out of ten leads, only a few will be good. 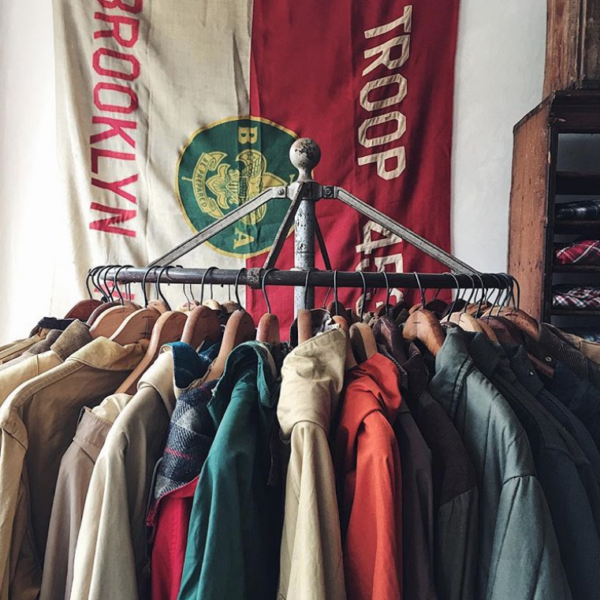 You network with other vintage sellers? Yea, it helps to have people out there who can tell you when they’ve found something, but aren’t in your specific market. 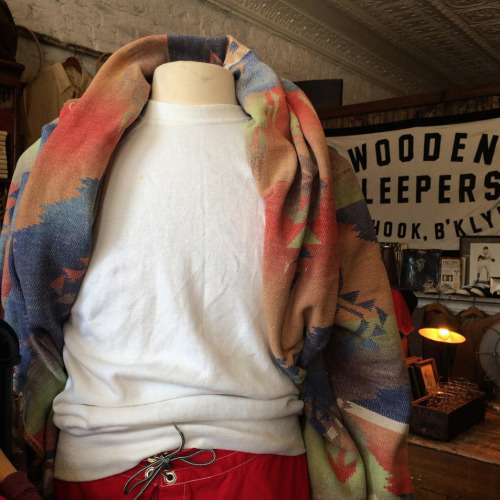 I once met an antiques dealer at a flea market who had a stack of old work clothes. 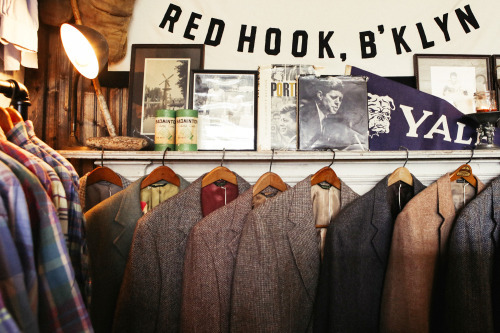 I bought the jackets and told him I had a vintage clothing store in Brooklyn. So, we traded info. A few weeks later, he called me out of the blue and told me he found an old, boarded up mom-and-pop shoe store in Ohio that has been closed since the 1970s. 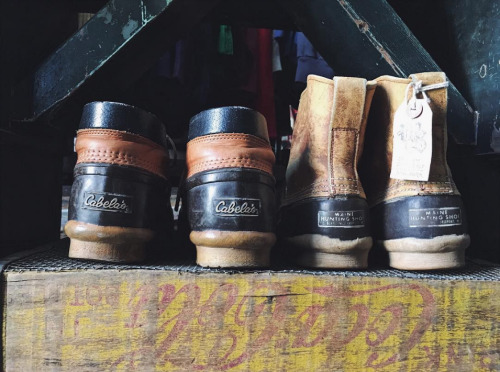 Inside were hundreds of deadstock boots. He wanted to know if I was interested in buying them. 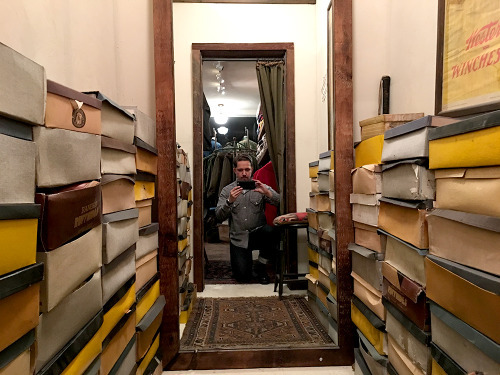 I was skeptical at first since sometimes things are deadstock for a reason – maybe they’re in odd sizes, for example – but he promised they had a good size range and everything was in great condition. So, I told him I was interested. He ended up driving all the way to NYC from Ohio and we met up at my store at midnight. I bought 150 pairs of boots from his inventory. Had shoeboxes going up to the ceiling that night. I’m surprised those things still happen. I can imagine finding up an old boarded-up place with deadstock items in the ‘80s, but with the internet, it feels like anyone can offload stuff online. I’m as surprised as you are, but those pickers still exist. From a business perspective, you’re getting the best margin. 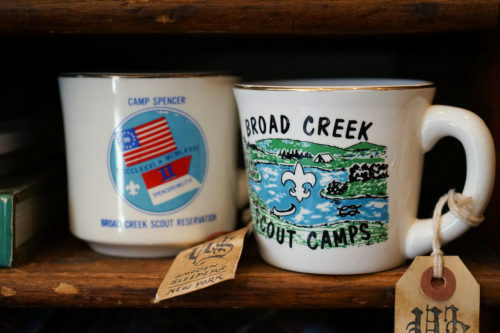 You’re getting stuff that people think is garbage, so you’re getting it for the lowest price, and then you’re able to find specialty collectors or buyers. It takes a ton of work. These people are often waking up at 3am just to find things, driving around searching for old stores, looking for hidden gems. It takes a certain kind of person. Do you ever get people coming in off the street with an unusual find for sale? Not yet, but I once got a call from Richard Press, the former President of J. Press. It was great because I’ve always been a huge fan of the company. He helped broker a sale where I was able to get a bunch of stuff that was in the personal collection of a former J. Press tailor. One that had worked for the company from about the 1960s to the ‘80s. 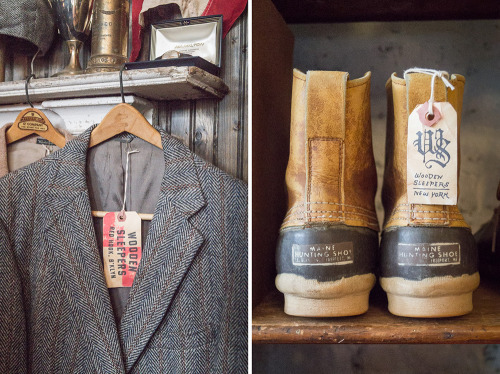 In the collection, there were hundreds of ties, sport coats, trousers, and deadstock shirts. It was so great to see Richard’s face light up, to see how excited he got about clothes. I feel like it’s so easy to get jaded about things, especially in the fashion industry, but Richard had this youthful excitement about him when he saw old things from his family’s store. It was really special. Are there things you’ve picked up along the way that you’ve decided to keep it yourself? Well, I always want to give my customers the first crack. 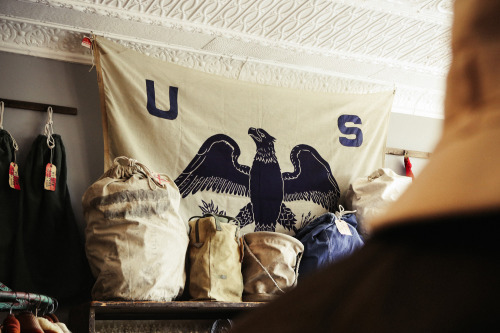 I’ve always hated those vintage stores that dangle the best stuff from the ceiling, but only for decoration. 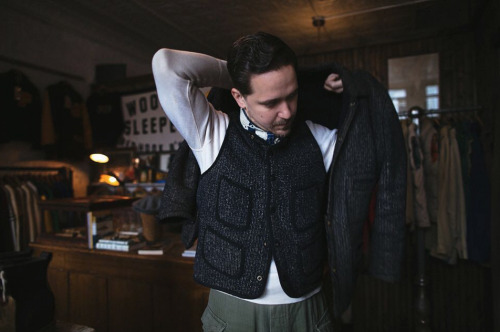 That said, I’m an outerwear nut and NYC winters can be brutal, so I was pretty excited to get a Brown’s Beach jacket to go along with the vest. The jackets are rarer than the vest, and I was lucky to find one that fits. 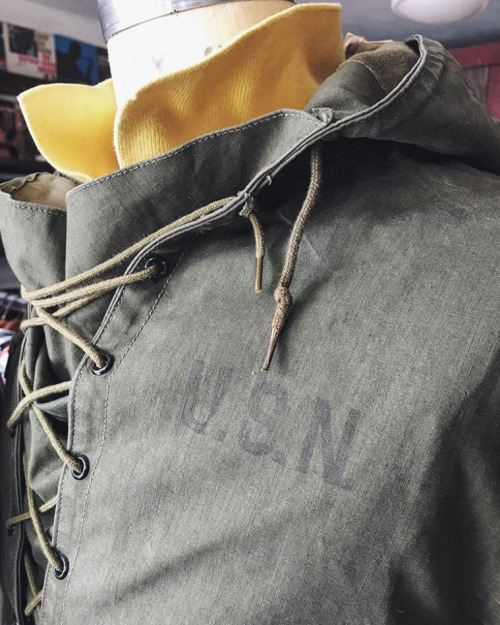 My 1940s USN deck jacket is also a favorite. Mine is olive; the navy one is a bit of a unicorn. A lot of the stuff I wear, however, isn’t that rare. I like madras shirts, old Brooks Brothers button-downs. 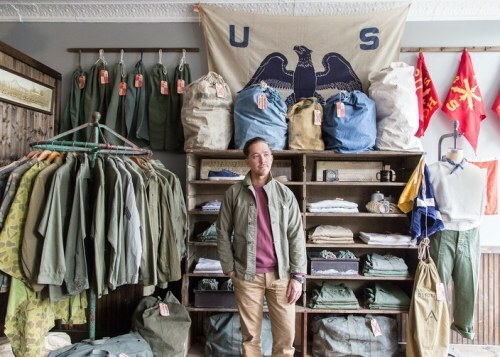 I like cut-off military khakis, vintage military jungle jackets. 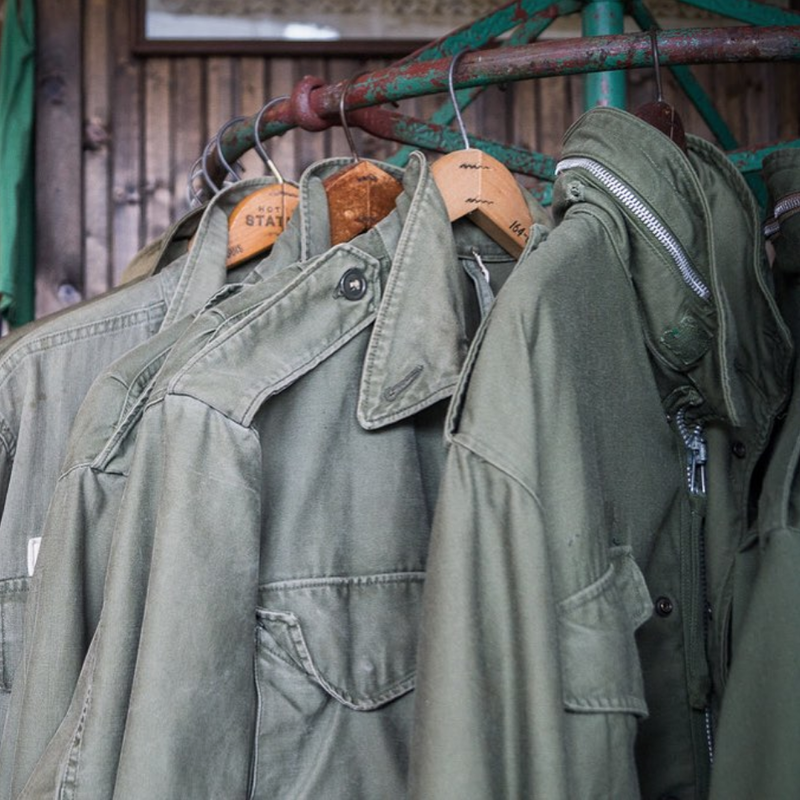 Anything from that ‘60s and ‘70s Vietnam War era, in the OG-107 cloth. 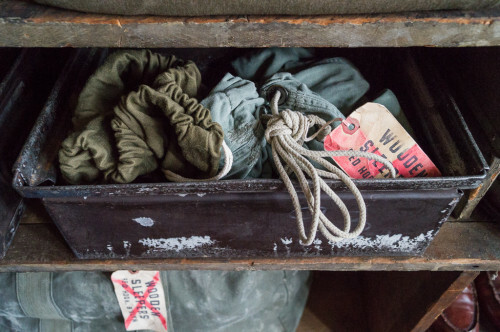 Some of those vintage military fabrics were made from a cotton-poly blend, especially in the later years, but the earlier stuff was often pure cotton. That’s the stuff you want because it ages in a really nice way. 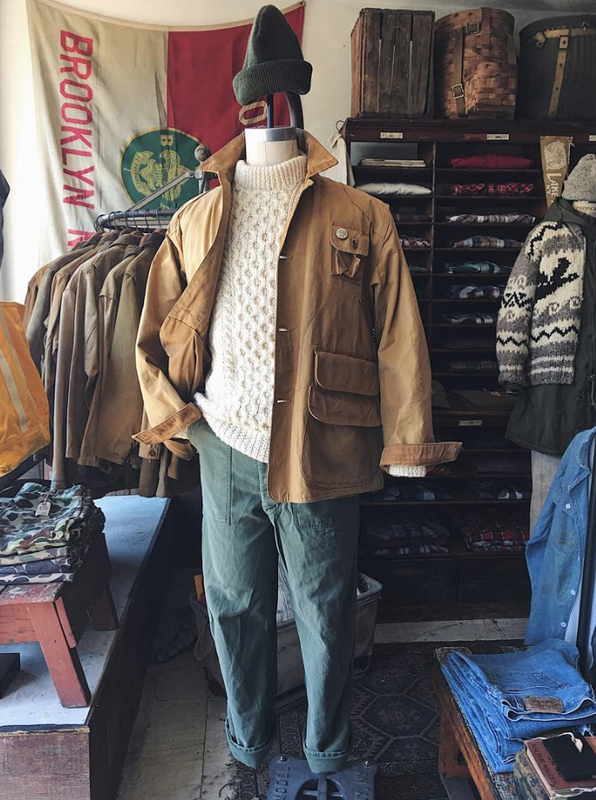 As a guy who cleans and repairs things for his store, do you have any tips on how to clean vintage clothing? A lot of it is common sense. Cotton things can be thrown into the wash; wool items will often need to be hand-washed or dry cleaned. 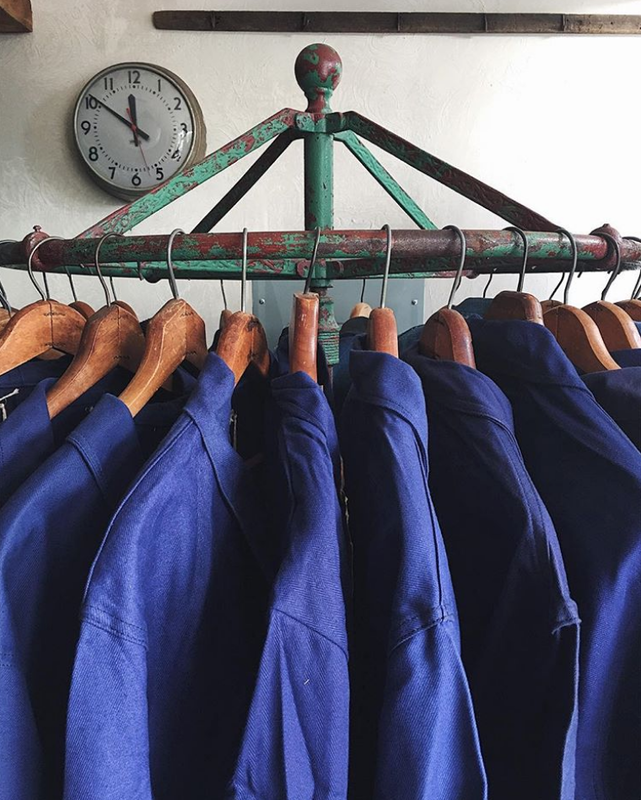 A lot of what I buy is vintage workwear, so they’re things that have been through a lot – a washing machine isn’t going to hurt them. There are some things I leave behind because they’re too raggedy, but there’s a lot you can save with a bit of mending and cleaning. 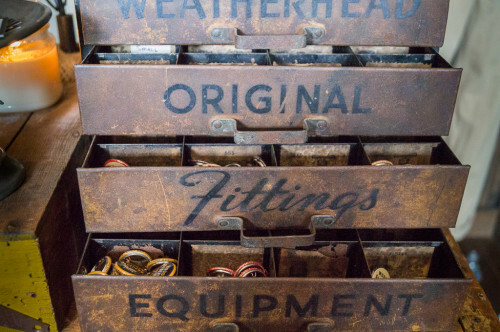 If you find a vintage item with a musty smell, you can also spray it with a 50/ 50 mix of white vinegar and water. It helps freshen it up a bit. 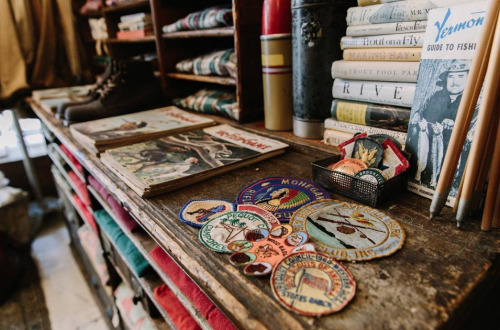 The vinegar smell goes away, and with it, it takes out some of the smell you occasionally find in vintage clothes. 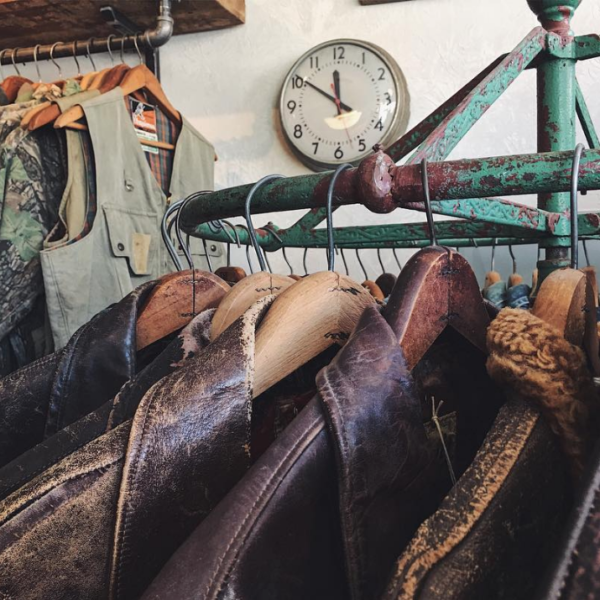 For readers who are interested in trying out vintage clothing, do you think there are some pieces that are easier to wear than others? 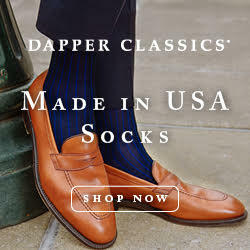 Definitely, go with the classics. 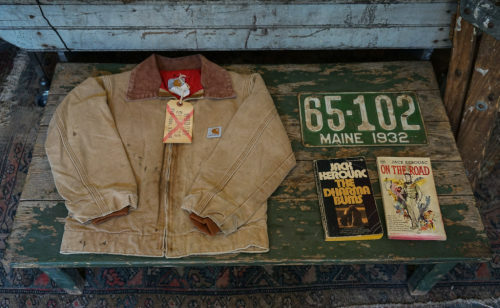 A French chore coat or a Levi’s trucker jacket. 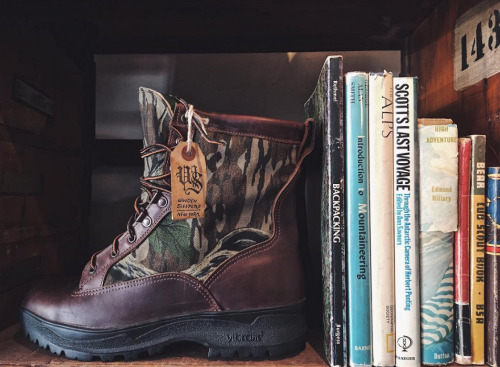 Unless you’re shopping at the very high-end of the market, buying brands such as The Real McCoys or RRL, you can often get a vintage piece that’s cheaper and cooler than more mainstream items. 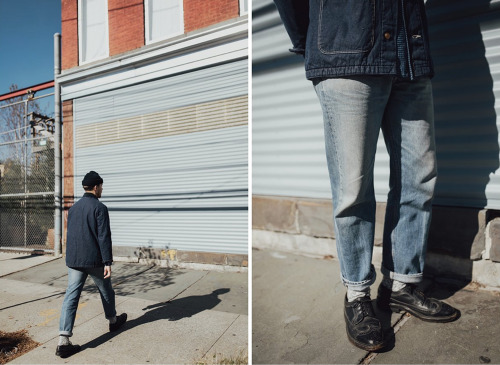 Even a Levi’s trucker jacket from the 1980s is going to look better than a mainline Levi’s jacket in the same style, but new. I also really like getting guys into bigger pants. The pendulum has swung so far into the slim-fit trend that guys can feel like it’s a revelation when they wear something fuller. 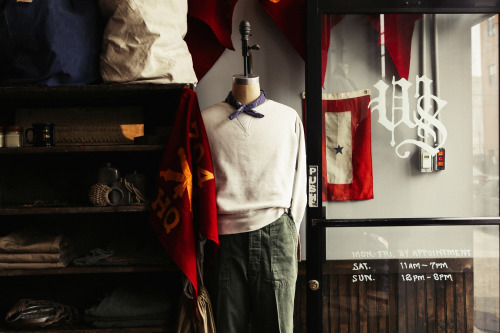 Maybe a pair of fatigues isn’t right for the office, but they’re great for the weekend. 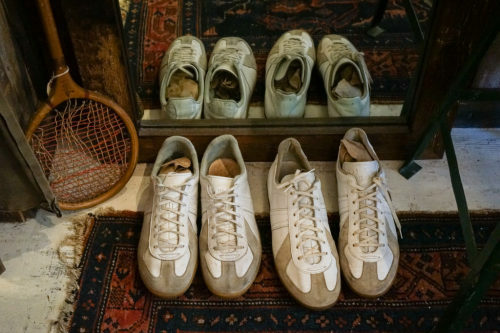 For spring and summer, you can wear them with simple, canvas sneakers, such as Jack Purcells or Chuck Taylors. 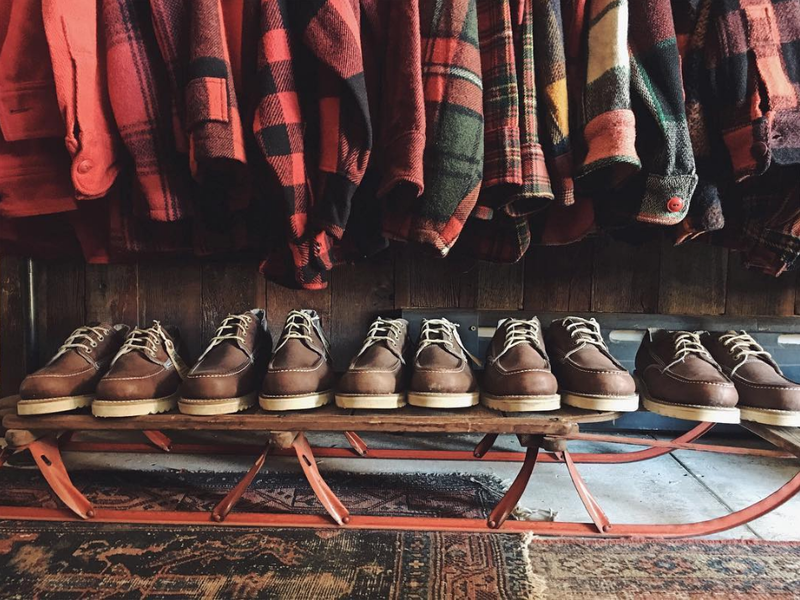 For fall, they look great with brown, plain-toe service boots. For me, the key to wearing fuller pants is that you don’t want a break. Otherwise, they can look really messy. If you roll them up a little, you get a fuller cut without any of the bagginess. M-65 military jackets are also really easy to wear. 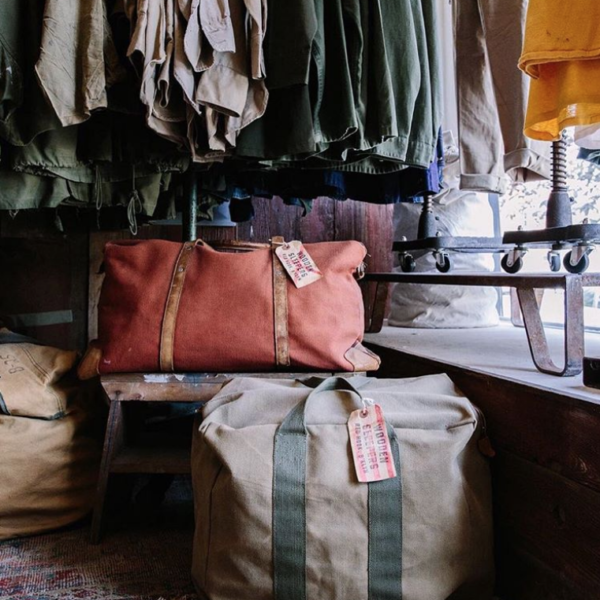 1950s and ‘60s military issue khakis. 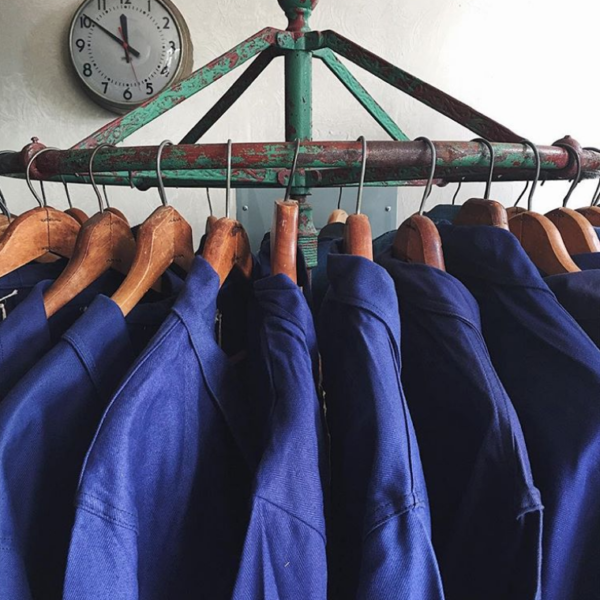 Denim chore coats. 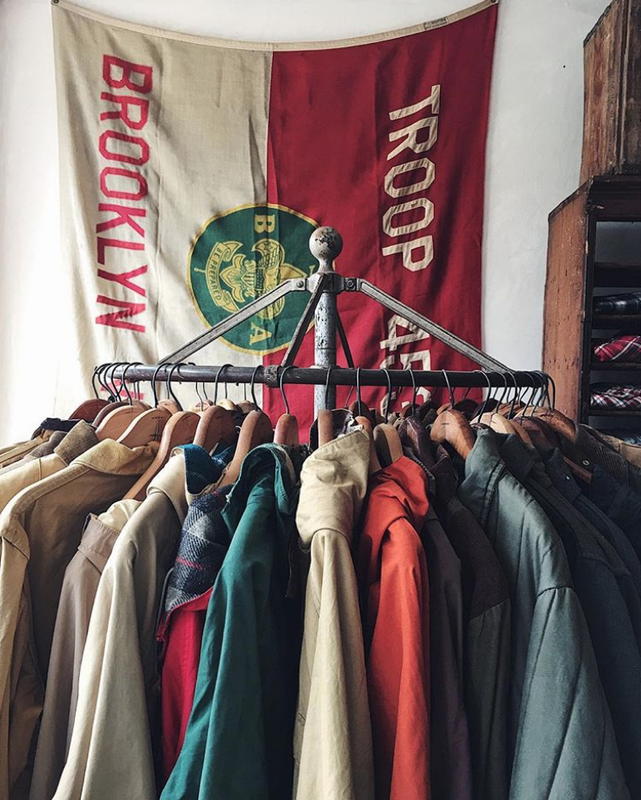 Especially with chore coats, if you’re not a connoisseur, you’re not going to care if a piece is from the ‘40s or ‘50s or ‘60s. The look is the same, which means you can come up on something that looks great, but is reasonably affordable. 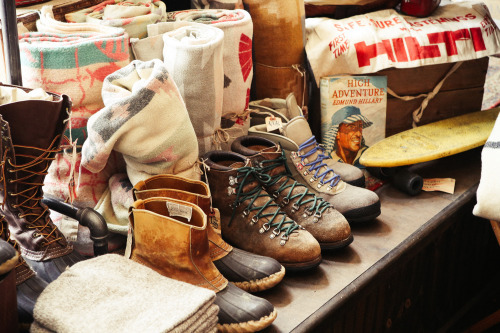 Again, they go great with jeans, sweatshirts, and heavy boots. They can fit a bit roomy, but I think that’s the charm. I know what you mean. 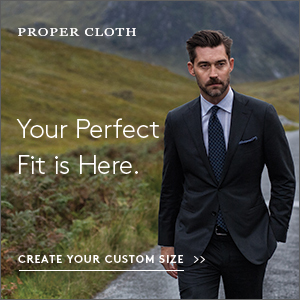 Sometimes when the fit is too precise, especially with workwear, an outfit can seem too precious. 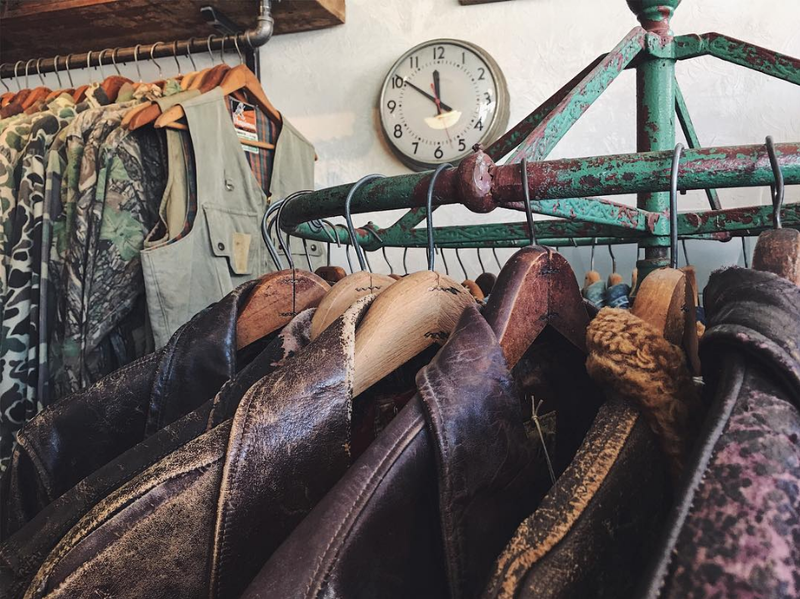 Ethan Newton once told me how he likes vintage leather jackets because they fit in idiosyncratic ways – which is just another way of saying they don’t fit perfectly. I think that can be good with certain looks. I agree. We’ve spent so much time talking about effortless style, but sometimes guys get too worked up over details. Just put on the jacket and wear it. A lot of this is much simpler than sometimes it’s presented online. It goes back to the first day of school and wearing a jacket that makes you excited, a jacket that makes you feel cool. It can be about a feeling. Thanks for your time, Brian. 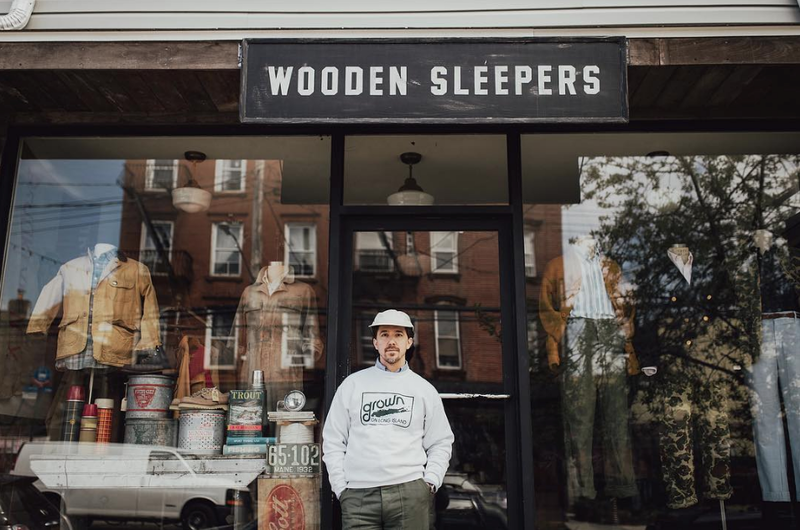 Readers interested in Wooden Sleepers can visit them in Red Hook, Brooklyn or shop from their new online store. They’re also on Instagram and Twitter, where you can keep up with their daily happenings.